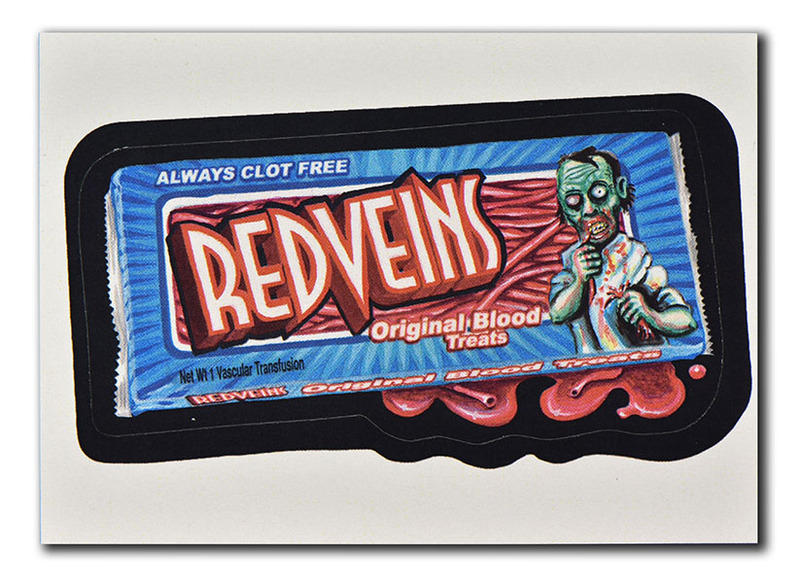 This was painted by Strephon Taylor, it was one of his first, probably the first after his epiphany about just how important Wacky Packages are. I believe he did it independently to impress Topps into letting him be more involved. His first contribution was less than well received and he wanted to redeem himself. However, Topps initially turned down Red Veins. Strephon had hopes they might use it later, so he did not want it included on the Lost Wackys checklist because he thought that might affect things later. Also, it was not officially commissioned by Topps so its status as a lost wacky is questionable. But he did allow it to be used as a Lost Wacky bonus sticker. Therefore most yellow/purple packs contained one. It was eventually released for real by Topps as a Foil Sticker in ANS3.